I work in a very diverse setting where more than 20 nationalities are represented within the faculty and student body. When you have such a diverse group, it is natural for there to be differences in communication, and these differences can lead to conflict. Having completed a graduate program with an emphasis in cross-cultural communication and having lived in multiple cultural contexts, I believe it is important to consider how we can work through our differences and be more understanding of our differences in communication. Communication is based on one’s worldview, framework of reference, culture, family of origin, gender, and more. It involves more than the spoken word, and styles differ between groups. For example, women use high-context communication more frequently while men rely on low-context or direct communication to relate. Similarly, the American default method of communication is based in individualism while the Middle Eastern approach begins and ends with community. If we enter a multicultural context and attempt to place our understanding on everyone around us, there is bound to be conflict. The key is to begin communication with listening. As little children, we are curious about the world around us and listen carefully as we learn about topics that are above our understanding. As we grow up, we lose this natural urge to learn through listening and begin to approach life from the perspective that we know everything and others should listen to us. However, as people cross borders more fluidly and organizations become more culturally diverse, it is to our advantage to learn by listening. Listen and learn. Observe the other culture and refrain from assigning a moral value to someone else’s method of communicating or doing things. Be willing to accept that their methods are as valid as yours even though they are different. Have the courage to communicate. When you clash, avoid antagonizing the other person. Instead, point out that there may be a miscommunication happening and ask the other person what they think you are saying, then listen carefully to their perspective. Tell them how you are approaching the topic from your cultural context and then try to find common ground. See the humanity in others. Jesus knew others would frustrate us, so He reminded us in Luke 17:3-4 that if someone did something wrong and apologized, we should forgive them, even if they offended us seven times a day. In the book The Five Languages of Apology, Chapman and Thomas describe healthy relationships as those where both people accept responsibility for their behavior, there is forgiveness and reconciliation, and the two parties work on building the relationship. 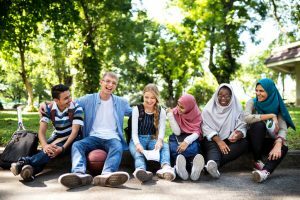 As we work together to communicate within our differences, we can build the healthy relationships that will allow the diversity of those we interact with to enrich our lives as we grow individually and learn from each other. Maria Lombart, MA, is the Executive Officer to the President at Middle East University in Beirut, Lebanon. She writes from her life experience as a Third Culture Kid (TCK), having lived in 6 countries by the age 18, with her graduate studies on TCKs focusing on loss and identity.